Juliet Kinchin joined The Museum of Modern Art, New York, as a curator in the Department of Architecture and Design in 2008, since when she has organized exhibitions including ‘What Was Good Design? MoMA’s Message 1939-55,’ ‘Counter Space: Design and the Modern Kitchen,’ and most recently ‘Century of the Child: Growing by Design 1900-2000,’ a major international survey of design for, and by, children. As a curator, professor and writer on aspects of nineteenth and twentieth-century design and material culture, she has a longstanding interest in gender studies and the social and political contexts of modern design.She is currently an Honorary Senior Research Fellow at the University of Glasgow where she was formerly a Senior Lecturer in The Department of the History of Art, and Founding Director of the graduate program in Decorative Arts and Design History. She has also held faculty positions in the history of art and design at the Glasgow School of Art, and the Bard Graduate Center for Studies in Design, Decorative Arts and Material Culture, and has worked as a curator in Glasgow Museums and Art Galleries, and London’s Victoria & Albert Museum. 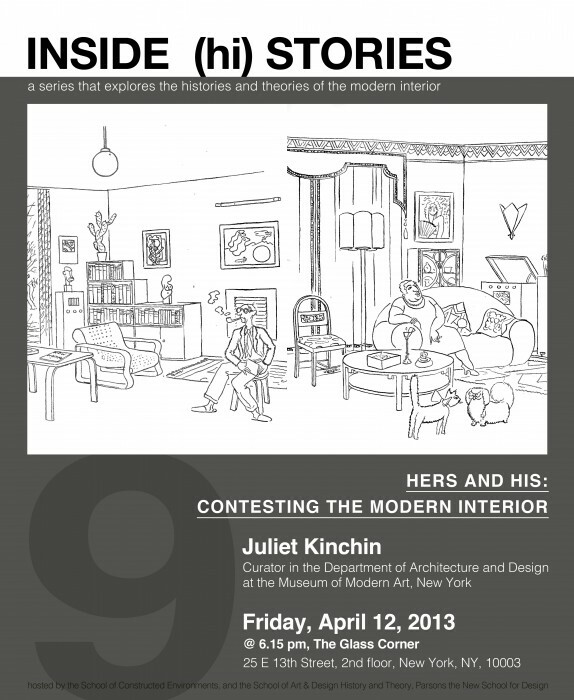 INSIDE (hi) STORIES is a Histories & Theories series, curated by design historian Sarah Lichtman (ADHT), and architectural historian Ioanna Theocharopoulou (SCE). Poster design by Livia di Mario.